Have you marked your calendar for The COR Community Fair? This event will be June 20th, from 9 am to 3 pm at COR Enterprises (2121 Lampman Drive). We will have several vendors present selling their products and services. We will have a huge garage sale and food available all day. Amber Adams, from Damsel in Defense, will be one of our vendors. She offers personal security devices. These would be excellent for anyone that hikes or runs or someone who lives alone. Do you have a loved one heading off to college in the fall? Amber's products provide safety and peace of mind. This entry was posted in Uncategorized on April 29, 2015 by Jodi Mackay. This entry was posted in Uncategorized on April 27, 2015 by Jodi Mackay. This entry was posted in Uncategorized on April 20, 2015 by Jodi Mackay. This entry was posted in Uncategorized on April 13, 2015 by Jodi Mackay. It's a week for being grateful here at COR! Today, we say THANK YOU to the Billings community and Lucky's Market! Through their Bags for Change program, COR Enterprises received over $1300 toward our mission of providing services to adults with disabilities! Our community dropped in over $600 worth of wooden dimes and Lucky's rounded up their half to $700! Anne Costilla presented the Lucky's Market portion to the Head Start, COR Enterprises and the YWCA this morning . This entry was posted in Uncategorized on April 7, 2015 by Jodi Mackay. This entry was posted in Uncategorized on April 6, 2015 by Jodi Mackay. 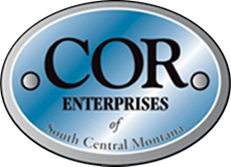 Dave Anderson, from Electrical Consultants, Inc. stopped by COR Enterprises today. For the 6th year in a row, he presented CEO, Tony Cline, a donation check for $10,000! 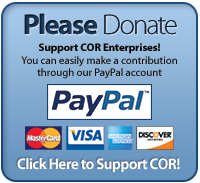 The clients and staff at COR Enterprises are so thankful to Dave and ECI for their continued generosity. This entry was posted in Uncategorized on April 2, 2015 by Jodi Mackay. Our COR Community Fair fundraiser is shaping up to be a great event. We are set for Saturday, June 20th, from 9 am to 3 pm, at COR Enterprises (2121 Lampman Drive). If you are interested in purchasing an 8 x 10 booth for our event, please contact Jodi Mackay (294-6115). So far, we have a variety of home-made craft and accessory vendors and representatives from Jamberry Nail Wraps, Damsel in Defense, Scentsy, ASEA - Renew 28, Kim and Eddy's vintage shop, Growth Thru Art and Origami Owl Living Lockets. We would love to add YOU to our vendor list! We will also have a huge garage sale as part of the fair. We are actively seeking donations toward this sale. We would greatly appreciate your quality, gently used items. Donations can be dropped off at our facility Monday - Friday. If you'd like to discuss the possibility of pick-up, please contact Tony Cline (294-6114). We encourage everyone in our community to come check out the COR Community Fair. It will be a fun event with a lot of variety. We look forward to providing an opportunity to our vendors to interact with the community and for the community to see what type of services COR can provide. This entry was posted in Uncategorized on April 1, 2015 by Jodi Mackay.